I'm so sorry about not having a weekend recap but we literally did nothing this weekend. Mark was in bed all weekend with the flu and we had to cancel all of his birthday festivities. We were both so bummed, especially since I had bought him New Found Glory and Yellowcard tickets as a surprise. We were hoping he would be better by Sunday night but he still felt terrible. Poor guy! I'm praying he gets better by Wednesday so we can enjoy our time with Mark's mom, Lauren and brother, Chase. The flu stinks! The good news is we put up our tree and I decorated our apartment for Christmas! I know it's a little early but Mark leaves for 17 days starting December 1st and I wanted him to be able to enjoy the holiday decor a little bit. Anyways, Happy Monday everyone! 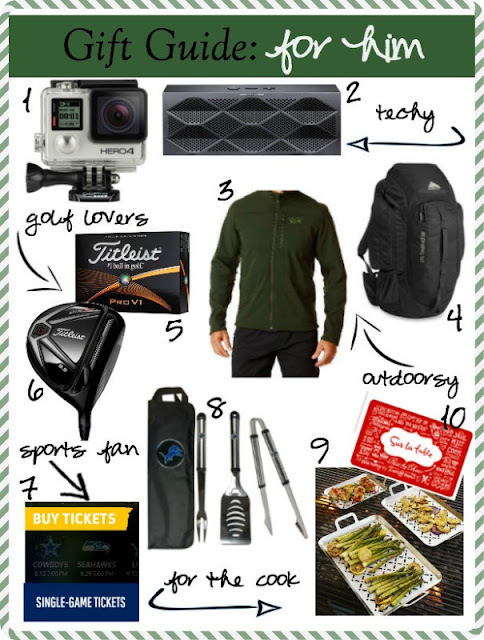 I hope you enjoy this little gift guide for the men in your life! Gift-buying for the men in our lives can be tough. I don't know about your hubby but mine always says he doesn't want anything. That makes it really hard when shopping for Christmas presents. I've become pretty good at keeping a running list of things he says he likes so I can buy them as gifts later on. :) My dad is pretty tough to buy for as well but I think this little gift round-up will help. I enlisted the help of my husband to figure out some gifts that all different kinds of guys would like to receive. I hope this helps you this holiday season! 1- GoPros are always a nice gift, especially if you buy the newest GoPro 4 Hero. This is a pricey present but will be much appreciated and loved by anyone, especially the techy loving guys. My husband already has a GoPro and he assured me he would be very happy getting the newest one. 2- I love Mark's Jambox because it's so easy to use and we can take it anywhere. I have a portable speaker too but it's not as small or convenient as Mark's. They come in all different sizes and colors and would be an awesome gift for a woman as well. 3- I find that most guys don't love to shop. I rarely see Mark or my dad buy clothes for themselves so buying them a clothing item makes a great gift. I got Mark a jacket a few years ago and he really liked it. It's more of an outdoorsy jacket but it's perfect for his work and our lifestyle here in San Diego. There are so many options out there but I really love the dark green color of this Mountain Hardwear Jacket. I even have a jacket by this brand and I LOVE it. 4- This is Mark's pick for the outdoorsy guy. He loves his Kelty backpack and uses it daily to store his workout clothes/ shoes, lunch, nalgene bottles, etc. It's held up really well and still looks great. This is a great hiking backpack too! 5/ 6- If you are the among the lonely wives who are married to a man who loves golf I am sorry and I feel your pain lol. My husband is obsessed with golf! He insisted that I needed a golf category in this gift guide so I included one :) I found these personalized Titleist Pro V1 balls and Mark loved them. It adds a personal touch on an already awesome golf ball. Apparently all really nice drivers are around $500! What?? I know, crazy right? Mark told me this Titleist 915 D3 is an awesome club and your guy would be blown away if he got this! Hopefully Goldsmith or Golf Galaxy will be having some good black Friday sales so you can pick this little guy up! 8- I saw this NFL grilling set and immediately thought of my dad. He has Lions and Michigan everything but I think he would love this. He might already have it haha. They have grilling sets for pretty much every team. 9- I was walking around Sur La Table the other day just taking pictures of gift ideas and things to add to my wishlist. They have so many cool things in that store! One of the items that I would love and I know most men would too are these stainless steel grilling trays. They even have trays for different meat. I think this is also a great idea for shrimp or scallops too. I can't tell you how many times I've tried to grill scallops and they fall through the little cracks! So annoying! 10- Another fun gift idea for an experience is to gift a cooking class at Sur La Table. They have hands-on classes, demonstration classes, or private events you can book yourself. This would be so fun to do with a group or even with your hunny. Just a side note- it's a good idea to make sure they like to cook otherwise they might think you are trying to give them a hint lol. Mark and I took a cooking class together and had a blast!